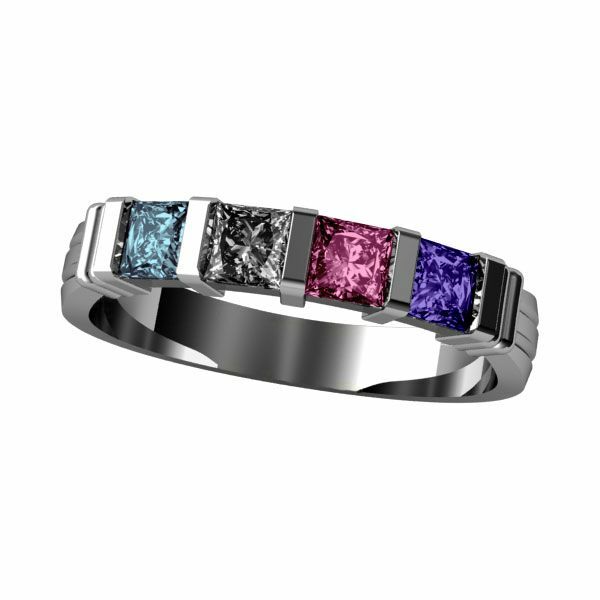 This beautiful Princess Channel Set Mothers Birthstone ring can be customized to fit your desires. Gift her This Ultimate Princess Channel set Mother Birthstone Ring, Mom Birthstone Ring, Mom Ring, Nana Ring, to show her that she is special and loved! I wanted a nice, simple ring, and searched for months; I kept coming back to this ring and finally decided on it; I had poor experience with other online ring sellers; always having to send it back to be fixed; these folks did it right the first time, and it is something I'll wear forever. Arrived on time and the person loved it. Would order again. Prettier than pictured. This ring is so delicately beautiful. Ordered 6 stone for myself, 4 stone for daughter. It is more attractive with 4 stones, but I am totally happy. Just received, so will know more about quality in a few weeks. I am very happy with this ring.The delivery and customer service were excellent. Grandma gift for mom. I got this for my mom with all 6 of her grandchildren's birthstones. She absolutely loves it and wears it every day. Sterling silver Mother's ring with 1-6 stones. The sizing is perfect. I was able to look at a gem stone website and the colors are true for each month. The seller placed the 6 stones in the order I requested. There are 14 prongs surrounding the 6 stones and appear to be securely placed. I am very pleased with this product and feel the price is reasonable for what I received. The stones are slightly and pleasantly bigger than the picture demonstrates. I am not a jeweler, but the setting appears to have room for more stones. As a Grandmother, I hope to try just that in the future. Very pleased. Like the other reviewer I wanted something simple that I would feel comfortable wearing every day. The ring turned out very well, especially for the price. Customer service from the seller was great, I got quick responses to questions. I am very pleased with the purchase. Great company to work with. Very friendly and fast service. Thank you.